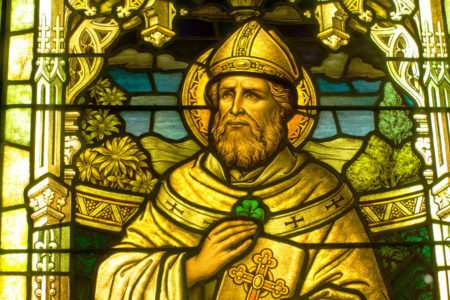 March 17 – St. Patrick, Bishop – An influential saint who, 1,500 years ago, brought Christianity to the country of Ireland. He was born about 385 in the British Isles, was carried off while still very young during a raid on Roman Britain by the Irish and sold as a slave. At the end of six years he contrived to escape to Europe, became a monk and was ordained; he then returned to Ireland to preach the Gospel. During the thirty years that his missionary labors continued he covered the Island with churches and monasteries; in 444 he founded the metropolitan see of Armagh. St. Patrick died in 461. After fifteen centuries he remains for all Irishmen the great bishop whom they venerate as their father in the faith.